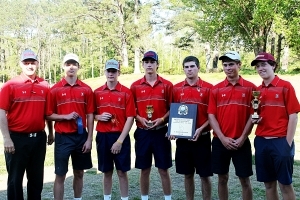 The Dunwoody Wildcats play to extend their stay at the top of the DCSD Golf Championships podium as the county golf teams converge on Sugar Creek Golf and Tennis Club on Tuesday. The Wildcats have eight consecutive titles heading into the 8:00 am tee off time tomorrow, including a 2014 tie with Arabia Mountain. The Wildcats return defending individual medalist sophomore Jackson Perry who shot a 73 a year ago and won the title in a one-hole playoff with Noah Kuranga. Also returning is senior Davis Brainard (79), junior Nick Trembath (82) and junior Ben Warren (83). Lakeside, which finished as the runner-up a year ago, returns seniors Zach Garlow (79), Harris Dasher (89) and Brennan Cox (91) to challenge the Wildcats. Arabia Mountain holds the only blemish on the Wildcats eight-year run (the tie in 2014) returns senior Nylan Washington (77, good for a tie for third) and junior Aaron Allen (104) from their third place finish in 2016. Chamblee wants to improve on its fourth place finish in 2016 and returns junior Jimmy McClendon (92), junior Parish Priestly (104) and sophomore River Harper (117) to challenge the top three from last season. The Tucker Tigers aim to crack the team standings for the first time since 2013 with its team at full strength heading into the tournament. Senior Davis Summers was the only Tiger to qualify for the full 18 holes a year ago. Cedar Grove’s Noah Kuranga returns for his senior season with his sights on the top prize after losing the past two championships (2015-2016) in playoffs after finishing 18 holes tied both years. 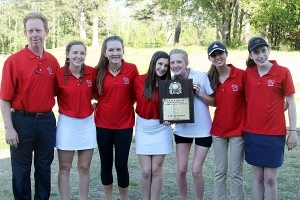 Dunwoody has won the past three girls’ team titles and has sights set on a fourth. Seniors Lauren Callahan (95) and Olivia Vergura (95) tied for second a year ago and both return trying to unseat three-time champ Mariah Kuranga (80) of Cedar Grove. Tucker turned in its best team finish in the championships last season with a second place finish behind Dunwoody. The Lady Tigers return seniors Meagan Hayes (112) and Daja Nicholson (117) who led the charge. Lilly Sarubbi brings experience and a better average into the 2017 championships. Third place in 2016 went to Redan which returns senior Nathaniel Michel (123) ready to challenge for a top 3 spot again. Chamblee returns sophomore Tiffany Li (110) who finished fourth overall in 2016. Sophomore Maxine Martin and freshmen Izzy Yap and Kristin Nwadike are dialed in to help the Lady Bulldogs get into the team standings.